Remember that Scheduler is a service rather than an application. Furthermore, in Windows 8 you configure its 'Tasks' via Settings and not Apps. Please realise that before you start creating tasks the Scheduler already has a large library of built-in tasks, much as it did in Windows 7. On closer inspection, these pre-configured tasks fall into two categories, those that are active and will execute if triggered, and those that are waiting for us (you) to configure with actions, triggers, conditions and settings. 's c h e d u l e', remember this is a setting and not an App. Alternatively, find Task Scheduler in the Computer management MMC. 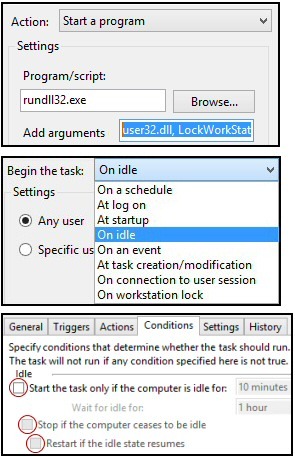 Once the Task Scheduler interface launches, we can build a job with a time trigger, and action courtesy of the Windows Defender's executable called MpCmdRun. Look under Actions in right pane. Once you have given the task a name, and possibly a description, observe your 'Next' button is now active. Trigger the task. Choose a time of day. 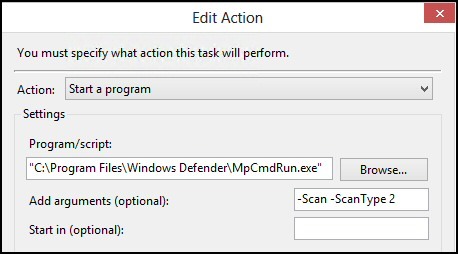 Action a program: specifically, browse to the Program Files\Windows Defender and select MpCmdRun.exe. Important for a Full Scan: Add this argument: -Scan -ScanType 2, see screenshot above. The problem: When you leave your computer people take liberties, for instance, they look at your email. Set the trigger for this task. Wait 5 minutes and the Windows 8 lock screen should appear. Tips: It took me ages to get this to Task to lock the workstation on idle. My advice is to start with a simpler task such as launching calc.exe with a scheduled trigger: every 5 minutes. Once an easy, basic task works, then experiment with above action, and experiment with the more difficult trigger: On idle. If you need to amend your task, click on 'Properties' on the right menu. I prefer to set the Conditions options to blank for this task, that is I remove all the ticks. My thinking is that because the trigger is On idle, we don't need any extra idle conditions that could delay locking the computer. Note: You could experiment with other triggers such as: 'At log on'. There have been changes in the logic and timing of Idle Time in Windows 8 compared with Windows 7. In a nutshell Windows 8 switches to Idle Time faster than Windows 7, making it a more suitable trigger for Task Scheduler, which relies on the operating to detect user presence. In Windows 8 if the power subsystem cannot detect any keyboard or mouse activity after 4 minutes it considers the computer to be idle. When the user is not doing anything the verification time is at 30 second intervals. The Windows 8 Task Scheduler checks or idleness since the last verification time. In Windows 8, the CPU and IO thresholds are set to 80%. A case of learn how to create a Metro-style tile once, and apply it to any Windows 8 executable. The key move is to create a shortcut to the executable. Create shortcut …. create on desktop is fine. Right-click the shortcut, 'Pin to start'. Press the WinKey and scroll to the right, there is the new Taskschd shortcut tile. There are numerous interesting options for beginning the task, for example: On idle, or At logon, furthermore, you can set a delay. You can investigate additional interesting options under the 'Conditions' or 'Settings' tabs, for instance run the task only when the computer is idle. Tip 1: Test your task by right-clicking and selecting: Run. Tip 2: To enable Task History, click on 'Enable Task History' in the right hand pane. My message here is try configuring one or more of these built-in templates, as a result you will get a feeling for what the Windows 8 task scheduler can offer. Autochk: This task collects and uploads autochk SQM data. Chkdsk: NTFS Volume Health Scan. Defrag: This task optimises local storage drives. FileHistory: Protects user files from accidental loss. Live\Roaming: Performs maintenance-related tasks between this device and cloud storage. SystemRestore: This task creates regular system protection points. Time Synchronization: Learn by checking each tab. What to look out for? Last run time obviously, but also delve into the settings and conditions for ideas to configure tasks for your 3rd party programs. Remember, the underlying engine is a built-in Windows service called 'Task Scheduler. My point:- this means you have a powerful, fully automated and robust resource just waiting for your instructions. There is a command line version of the Task scheduler called SchTasks. Help reveals the /query parameter, however I could not find a way of filtering the output. You can also import tasks created in Windows 7. The technique is to export the task in .xml format, then Import task in Windows 8. You may find that your Windows Task Scheduler is already populated by tasks. What you are likely to find is tasks that Google and perhaps Microsoft itself have created automatically. It's well worth playing detective and trying to work out the action and trigger for each task. 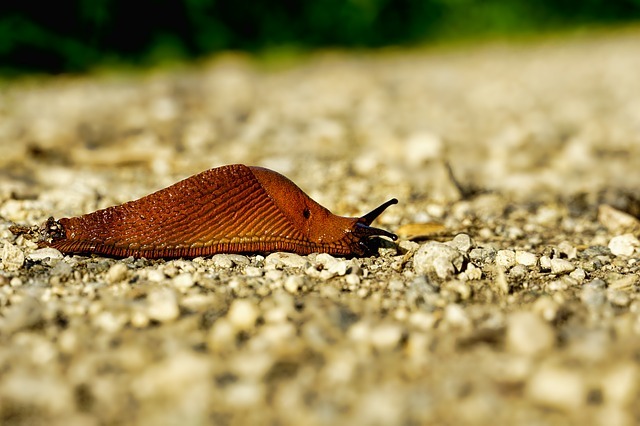 One common theme is update, they are designed to launch a local program which checks online for the latest version of that particular software. To get started, from the Metro interface type: 's c h e d u l e', and look in the 'Settings'. Once the Task Scheduler launches, then you can create a job with a time trigger, and action. My advice is to look at examples in the extensive built-in library.